For distinguished service to the steel industry and for his mentoring of young professionals. Robert G.H. Lee, an engineer whose inventions reflect the best of ingenuity, devoted his life’s work and entire career to the field of metallurgy while working with Air Liquide Canada. 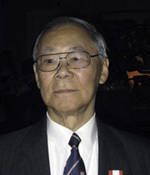 Dr. Lee is known for inventing techniques to refine metal that have increased production efficiency worldwide and for pioneering the development of the GAZAL process, the precursor to ladle metallurgy. His invention of the annular tuyere resulted in the OBM/QBOP steel refining process and the QSL Process for continuous smelting of lead sluphide concentrates and now being commercialized for smelting of copper sulphide concentrates. Dr. Lee graduated in 1947 from McGill University where he earned a bachelor’s degree in metallurgical engineering. He also received his Doctor of Science, honoris causa from McGill University. He joined Canadian Liquid Air in 1947 as a research assistant in metallurgy. In 1980 he was appointed director of research and technology, a position he held until retirement. Since 1990, he has served Societe Air Liquide and its subsidiaries as an independent technical advisor, working on assignments in direct smelting of iron ore and smelting of nonferrous materials, among many others. Dr. Lee devoted his entire career to research and development for Air Liquide Canada and also, after retirement, the Hydrogenics Corp., Mississauga, Ontario, Canada, where he has served as special advisor to the hydrogen fuel cell and hydrogen production company. Dr. Lee is credited with more than two dozen inventions and has been named inventor on more than 200 patents worldwide in the fields of pyrometallurgy, hydrometallurgy, environment, energy, pulp and paper, chemical, food and mosquito abatement and other fields pending. Among numerous honors, Dr. Lee was a recipient of the Benjamin F. Fairless Award (presented by AIME) in 1992 and the Distinguished Member and Fellow in 1995, both from the Iron & Steel Society (ISS). He received the Distinguished Member and Fellow award for his distinguished achievements in gas technology developments for the steel industry including the annular tuyere for steelmaking and the porous plug for ladle metallurgy. In 2003 he received the Tadeusz Sendzimir Memorial Medal from the Association of Iron and Steel Engineers (AISE).